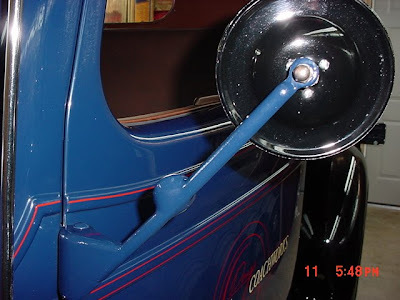 In 1937, Chevrolet didn't offer a thermometer on an original truck mirror arm, but I thought it would be pretty cool to have one on my truck. I won an auction on e-bay for a Joma Thermometer Mirror. The mirrors clamp to the edge of the door, but I wanted the thermometer on my original mirror arm. I welded up a pod on my mirror arm to hold the thermometer and repainted the arm. 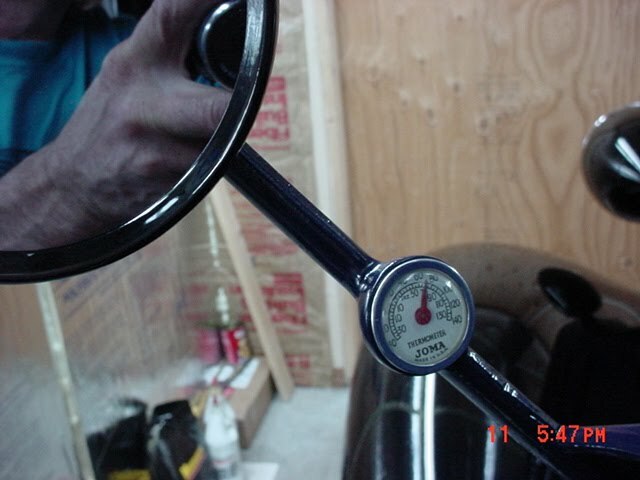 It looks like it could have been a factory installation, and I've been enjoying the convenience of looking at my Joma thermometer to get an accurate indication of the ambient temperature every time I take the old 37 Chevy truck out for a drive. I had the thermometer reading 100 degrees on my return trip from North Carolina as I was cruising down the interstate at 70 mph.